Here is a good topic for everyone. Whats your thoughts on stocking some bullheads in a new pond for extra forage for bass and for kids to catch. When i was a kid all the old farm ponds had lots of bullheads in them and there was always nice healthy big bass. Anymore very few of these same ponds have bullheads since they have been cleaned out or had channel cat added to them. I am thinking there has to be some good in have them in a pond. i remember those huge schools of baby bullheads and the bass just going crazy eating them. any thoughts? I was thinking about stocking 25 of them in a pond. I don't think they really make much difference. If you want variety add some. A pond with a healthy established LMB population should keep them under control. I agree I have a small pond over ran with bullheads but the added a few bass and the bullheads are well kept in check and both fish species are huge and healthy. So is what I am hearing is that bullheads are good for bass forage. And bullheads don't grow very big they probably dont compete with bass for food that much. I know nobody wants bullheads but bass love them and they are very fun for young kids to catch. So really what are they hurting? Are bullheads the same thing as mud-cats? flatheads (mud cats) prey only on live fish"
KSBASS, in a KS pond with LMB and black bullheads, you almost certainly will end up with a low density of big (2 pound?) bullheads that the kids will occasionally catch. Those are impressive fish. As you probably know, their offspring each summer will school in pods, and the bass will find them very easy prey. I think the general resistance to bullheads is that they overpopulate and stunt when there aren't enough predators, and so people just sort of generally avoid them. Dave-Not to hijack thread [can start a new one if needed], but could you give some insight into your experience with SMB and BH? Yolk -- I can't tell you! I don't know what SMB and BH would do in a pond. I have no experience on that combiination whatsoever! You'd think that those pods of young bullies are so vulnerable that the smallies could/would get them, but the smallies are not as effective a predator as LMB. I guess we would have to consider such an effort to be experimental. Wonder if anyone else has any observations? are also sometimes known as mud-cats. catfish informally referred to as mud catfish"
TJ and Sunil have bullheads swimming with smallmouth. TJ's I know are not a problem. I think the combination of a lot of predators as well as the bullheads possibly getting a late start in relation to these predators. They were well established before the bullheads found their way in and I think he rarely sees them. Thanks, Omaha. That certanly makes sense. This is gettng pretty far afield on a bass vs bullhead thread, but does any know if WE will consume BH? Just discovered that some of the WE my fish guy stocked 4 years ago as a lark have survived. Just about any predatory fish will eat another fish if it can fit it in its mouth and they run into each other in the same habitat. Since WE get fairly large and BH start out very small, they both are nocturnal and bottom related fish, I suspect WE will feed on BH. There are far more ideal prey items for WE than BH. Just like there are far more ideal prey items for LMB than BH as well. Thanks, CJ. I wasn't thinking of adding BH specifically for feeding the WE, more wondering if the WE would contribute meaningfully to controlling a BH population, when paired with SMB. Might be a little risky, as there is a lot of cover in the pond and I'd fear that a lot of the BH might escape predation. I would not intentionally stock bullheads. There are so many other options that would be better in my opinion. My pond eventually arrived at a substantial population of advanced sized bullheads, 10-14"+, that were not subject to any predation. This was with 5lb. + LMB in the pond. Once a bullhead gets 12" +, I don't think they get eaten much by LMB. We did a mass fishing derby to eradicate them. We took out maybe 80+, and it has made a huge difference in our immediate fishing area. catmandoo cleaned most all of them, and found FA in most all of their guts. They could have been rooting in the FA for some other organism, but none the less, they consumed it. I once saw a feed trained smallie torpedo a 14" bullhead that was hitting the feed. Made me proud. FWIW- Here's my experience with BH. I never knew I had them in my ponds until I had a winter kill. My LMB froze out 5 winters ago. I decided to try something new and not restock LMB not knowing I had BH in there. I think the LMB where eating them as fast as they were born. About 3 summers ago, for the first time, I noticed a pod of bullheads swimming. Fast forward to today, I am now forced to either add a predator like a LBM or kill and start over. THOSE BH ARE EVERYWHERE! Bottom line as I see it...If you ever have a fish kill (DO sag, super cooling, or such) the BH will most likely survive. And without predation those bad boys will take over very quickly! As much as I like eating those ugly buggers, I would avoid them at all costs. The LMB, if stocked large enough can maybe control the cats. But, it takes time. Like several years and your mileage might vary due to climate differences. 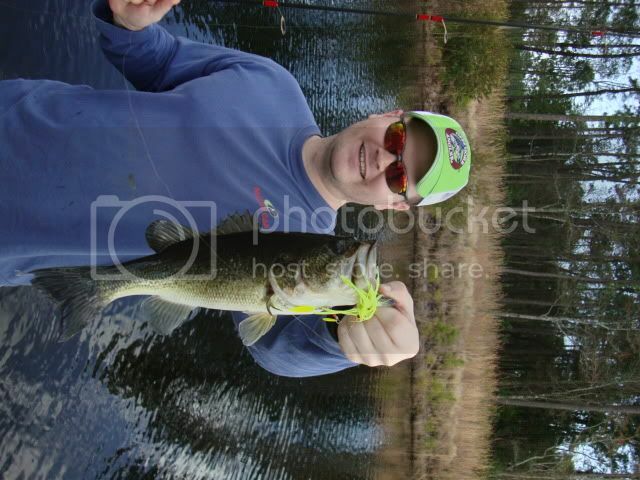 Many, many years ago, we inadvertently found that a small ranch pond had 2 to 3 pound bass. The owner didn't know there were fish in it. So, we proceeded to start eating bass. Within a couple of years we only caught bullheads. There weren't enough bass to control them and the BH's had started to control the bass. We had screwed up the balance of the pond. So, finally we started bucket stocking 12 to 13 inch bass. Within about 3 years, it once more had nice bass and some whopper bullheads. I was wondering if CC could knock back my BH numbers. I really don't want to start over and I am trying to avoid LMB. I am thinking of putting in 10-20 between 18"-24" this summer. Could CC do the same type of control like a LMB with regards to BH's? Not the same, but they will eat BH.